A striking peak, especially when seen from Cupola Basin Hut, with a variety of routes. 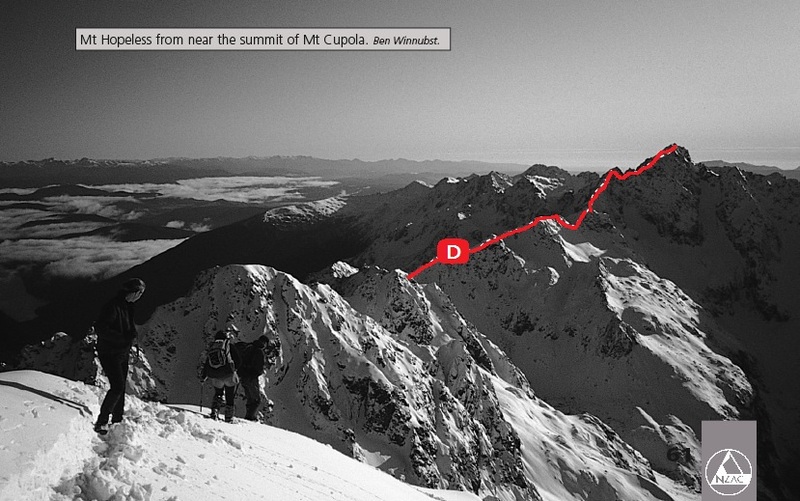 An excellent spring and early summer traverse is to climb the Hopeless Couloir and descend the South West Ridge or the Hopeless Creek route to Hopeless Hut. Reputedly named by an early survey party with a poor attitude. Hopeless Creek Routes A marked track leads from the Travers Valley to Hopeless Hut. A popular trip is to continue up the valley and across Sunset Saddle to Lake Angelus. This route angles up scree (the slopes above catch the sun early, beware of avalanches or ice cannonballs) to a ledge, which gains the crest of the cirque headwall. Continue past tarns to Sunset Saddle (see Sunset Saddle Route Mt Angelus). Five minutes below Hopeless Hut cross to the true right of a side stream. 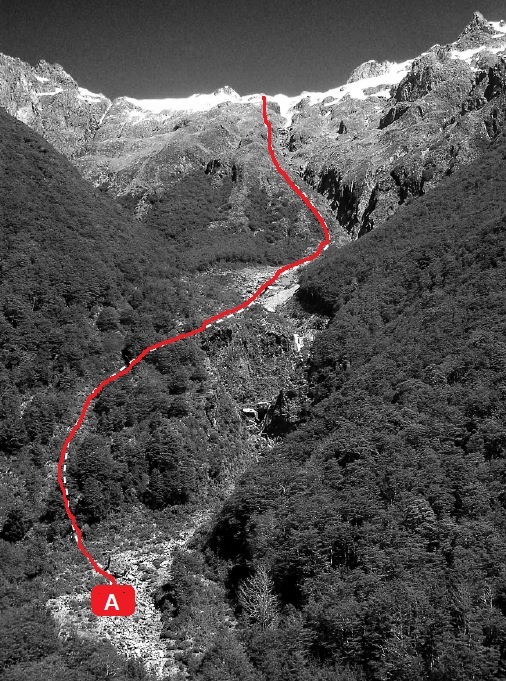 Climb a steep cairned track on the true right to avoid a deep gorge. Beware of avalanche danger in spring (the route follows an obvious avalanche path). When the stream levels, climb through scrub to a series of narrow ribs (look for cairns here) which lead to an often snow-filled basin (map ref. M30/889178). Head south-west to a col in the east ridge (overlooking the Hopeless Couloir) then climb a gut angling to the Travers Range. In summer or in icy conditions, a safer alternative is to climb from the basin to the outlier peak to the north. A short scramble leads south to the summit. Mostly easy scrambling to the basin, but beware of loose rock (in summer) or winter ice in the gut above. A good descent route. Twenty minutes up the Travers Valley from Hopeless Creek, leave the track and climb to the toe of a narrow scree chute which gives a direct route to the East Ridge. 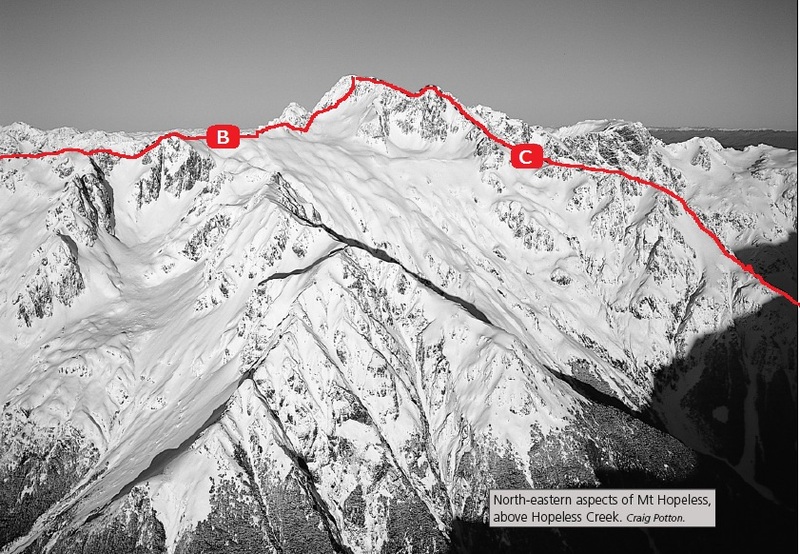 The ridge is long; difficult pinnacles and minor peaks can be turned on the north. Eventually the col in the Hopeless Creek route is reached. The ridge rises between the side-streams either side of Hopeless Hut, and is easily gained from a basin just north of the basin in the Hopeless Creek Route. Spectacular views from here across huge rock faces in the next side stream above the hut. The ridge has been climbed but is difficult. From the top of the ridge, a narrow broken ridge joins it to the northern outlier peak of Hopeless. Gendarmes on this section can be turned via exposed ledges on either side, or else the broken ridge is avoided by descending a narrow couloir on the Sabine side and regaining the ridge just under the northern outlier. 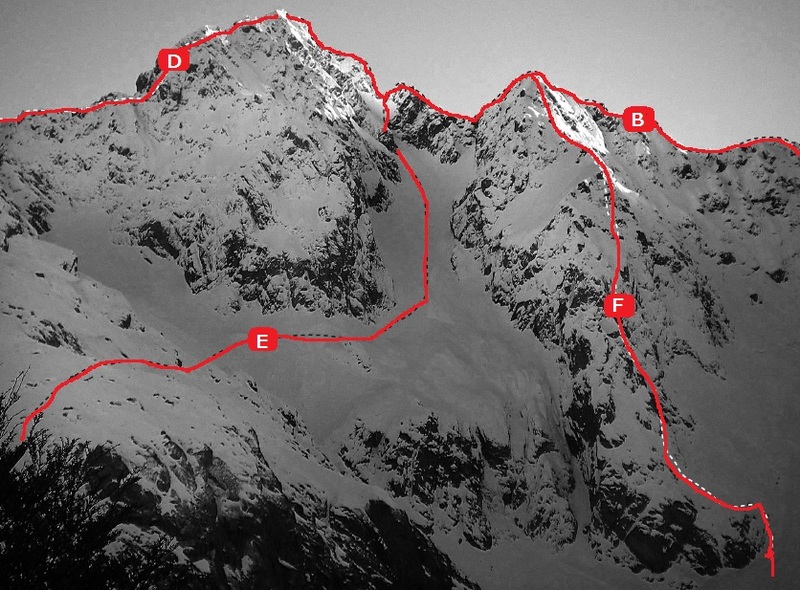 A difficult route with a huge gash, a steep face and sharp pinnacles to overcome. The ridge is easily gained from a tributary creek, 1km upstream from Hopeless Hut. Pleasant scrambling over minor peaks is halted at a deep gash. A difficult descent down a steep, smooth and exposed ledge reaches the gully on the Sabine side, below the gash, then from 30m below the gash climb mainly firm rock back to the ridge. An alternative is to descend from just north of the gash into the top of a large basin on the Hopeless Creek side, climb up to the gash and then cross over to climb rock on the Sabine side. Further along the ridge, a second, easier notch is crossed, and up to the top of the North East Ridge. Then follow the North East Ridge route to the summit. From Cupola Basin Hut, ascend to a saddle on the Travers Range (just below Pt 1989) where the ridge begins. A series of sharp teeth can be turned on the west by descending a gut to a ledge, which angles back to a notch in the ridge. The summit pyramid is steep climbing on good rock. Boulders in a chimney can be turned by a tight crawl underneath. This is one of the last remnants of the glaciers which carved the mountains and valleys of the park. During summer it becomes crevassed and is sometimes cut off. Beware of avalanche risk in winter. Sidle upwards to the bottom of the couloir from Cupola Basin Hut. The couloir is initially wide but narrows and steepens towards the top where a rope may be needed, and ends at the col in route 5.20. Alternatively, from a bivvy rock or campsites above the forest in the northern head of Cupola Creek climb bluffs to the bottom of the couloir. In winter, there is a technical frozen waterfall ice route (two pitches) on these bluffs. A striking rock buttress on the right of the couloir. Ben Winnubst. Craig Potton. Davi Jewell.